I had quite a handful of plums sitting around that needed to get used up soon. I initially bought them to make a Brioche Plum Tart, but ended up using a different fruit instead. So with these plums on hand, I went to search for recipes to use them. The following recipe caught my eye and with only a handful of ingredients needed, I decided to give it a try. Overall, it was a nice recipe. The preserves came out sweet but there was a lingering bitterness afterwards. Maybe this was due to the skins since the plums weren't peeled before simmering Regardless, all is not wasted because I wanted to make the plum preserves to use in a savory dish, which is yet to be determined. I'm thinking perhaps poultry - chicken or even duck - would be nice to pair the preserves with. So stay tuned for that recipe sometime next week! 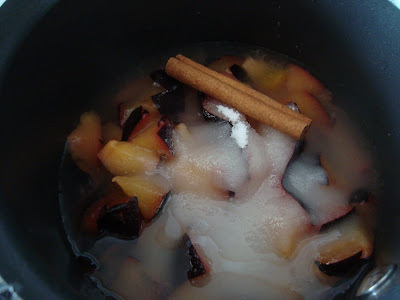 Coarsely chop plums and stir together with sugar, water, and cinnamon stick in a 2-quart heavy saucepan. Simmer, uncovered, stirring occasionally (more often toward end of cooking to prevent sticking), until thickened and reduced to about 2 1/2 cups, 45 minutes to 1 hour. Discard cinnamon stick and cool preserves. Transfer to an airtight container and chill, covered. Cooks' note: ·Preserves keep, chilled, 1 month. Looks delicious! 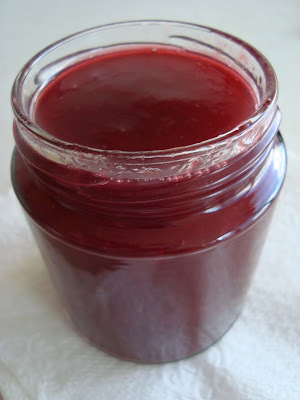 I'm always looking for recipes for easy fruit preserves. Thanks!